The Lotus Notes Migration tools allow users to migrate mailbox data from Outlook Express, Microsoft Outlook, and Exchange Server to IBM Notes. The nUpgrade.exe is useful for you if you’re switching from Outlook Express or Outlook to Lotus Notes. 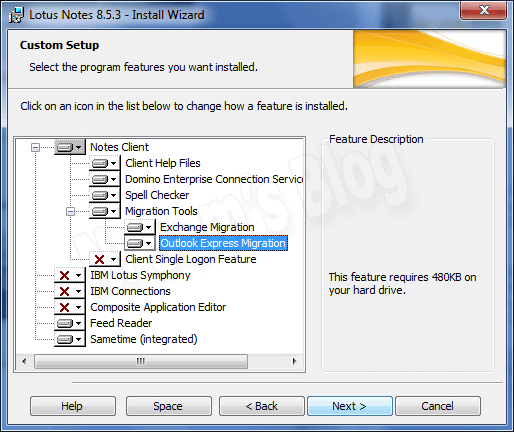 Here I’ve explained all about Lotus Notes Migration tools and how to install them on your system. Do you use emails in your day-to-day life? I hope you must! In this modern era, email is the best medium of communication all around the world. Everyone is highly dependent on emails, be it an individual, a small business or a large organization. Excessive use of emails has created a market for email client programs. An email client is a computer software or an online webmail site that provides you a place from which you can send email messages to others and receive from others. There are various email clients available in the market, both commercialware as well as freeware. 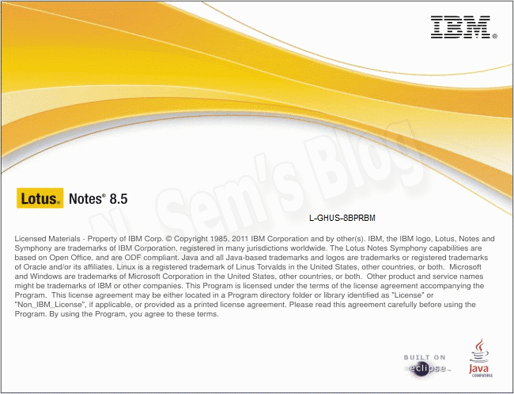 Here is this post, we’ll talk about IBM Notes, aka as Lotus Notes. IBM Notes is an email software client provided by IBM aka International Business Machines, that offers you business collaboration functionality including email, contacts, calendars, to-do lists, feeds, etc. into an easy-to-use workspace. Also, you can use IBM Notes as a stand-alone application, and with IBM Domino Server (formerly known as Lotus Domino Server) as well in order to make it a client-server software platform. IBM Notes email client has a built-in feature that enables users to migrate their email data from Outlook Express, Outlook or Exchange with ease. The Lotus Notes Migration Tools (aka nUpgrade.exe) are highly useful in case if you want to import your mailbox data from other email clients to IBM Notes. It performs migration from Outlook Express, MS Outlook or Exchange Server. Since it comes as a built-in tool with IBM Notes, so there’s no need to download it from any other source. But it would be only available if you have selected it during Lotus Notes installation. 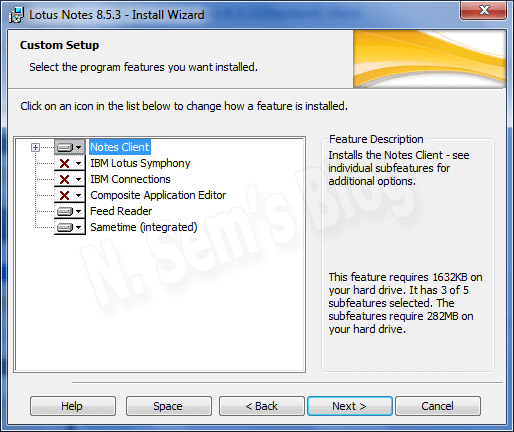 I have described the whole procedure for Lotus Notes installation below. 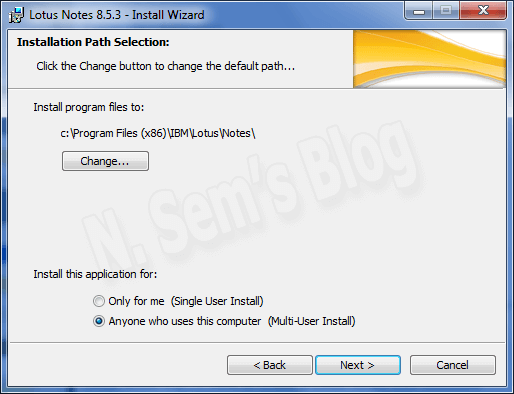 Also, I have shown how to install Lotus Notes Migration tools on your system at the time of installation. 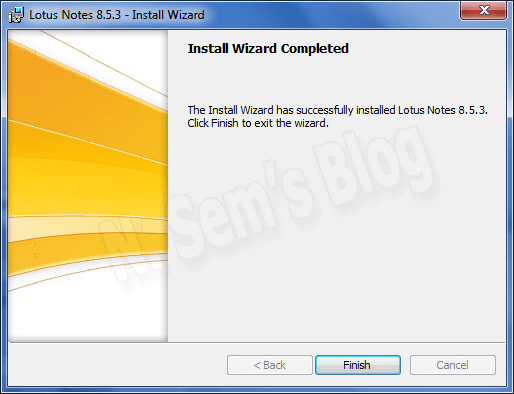 How to Install Lotus Notes? Be patient while the setup is being processed. 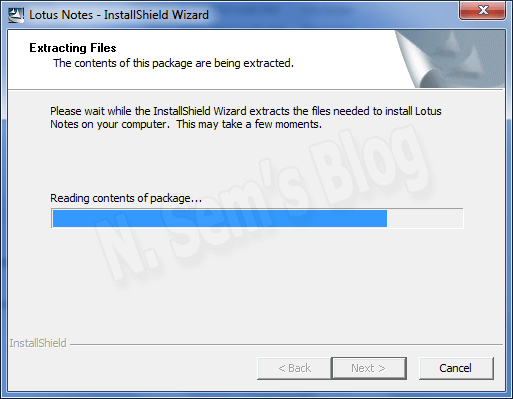 Step 2: You can see the Lotus Notes – InstallShield Wizard on your screen. Now remove the installation files. 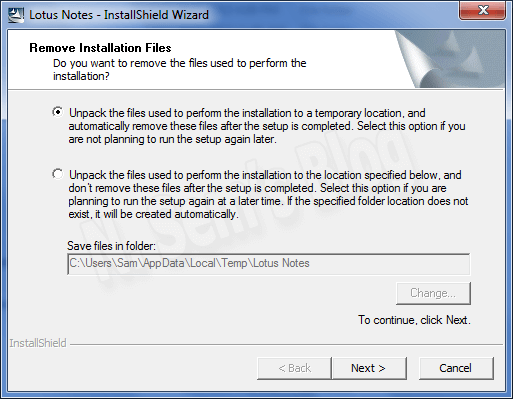 Select option #1 to unpack the files used to perform the installation to a temporary location. You may also select option #2 to unpack the files used to perform the installation to the location specified below. If you select option #2, you can change the folder location. Then click Next to continue the process. Step 3: This will start extracting the contents of this package. Please wait until the process is running. It’ll take a few seconds to complete the extraction process. 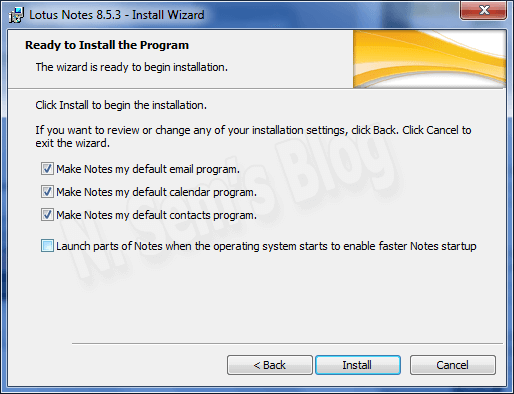 Step 4: The Lotus Notes 8.5.3 – Install Wizard will appear on your screen. 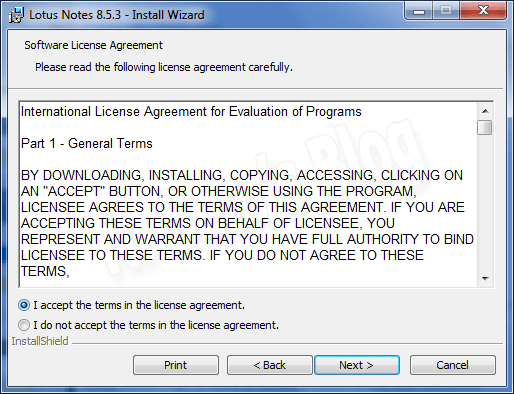 Step 5: Read the software license agreement here before installing it on your system. Check I accept the terms in the license agreement box and click Next. You can change it if needed. Also, define Single User Install or Multi-User Install here. Click Next. Step 1: In this step, you need to select the program features you want to install. Click the drop-down arrow near Notes Client. Step 2: Again click the drop-down arrow near Migration Tools. Click This feature will be installed on local hard drive option to enable this feature. Step 3: The Migration Tools feature is available for both Exchange as well as Outlook Express. Click the drop-down arrow near Exchange Migration. And click “This feature will be installed on local hard drive” option to enable this feature. Step 4: Now click the drop-down arrow near Outlook Express Migration. Click “This feature will be installed on local hard drive” option to enable this feature. Step 5: The Migration Tools feature is now available for both Exchange as well as Outlook Express. This is an optional feature. If you don’t want to use Migration Tools feature, you may keep it disabled. Click Next. Step 6: The wizard is now ready to begin the installation. Check the options given above, and select them as per your requirement. Now click Install to start the installation process. Step 7: The program features you have selected are being installed. Please wait until the installation process gets successfully completed. 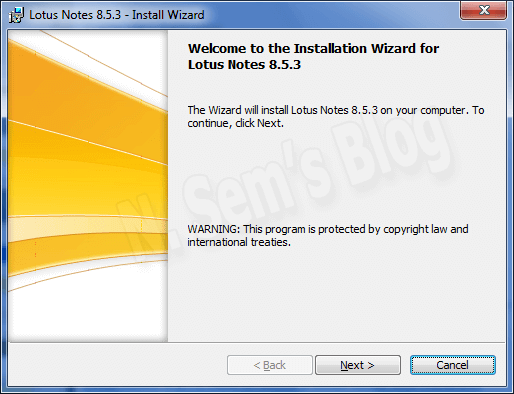 Step 8: The Install Wizard has successfully installed Lotus Notes 8.5.3 on your system. Finally, click Finish to exit the wizard. I hope the above tutorial would be helpful for Lotus Notes migration.